Correcting and concealing dark circles or under eye hyper pigmentation is one of the most common yet hardest tasks when it comes to makeup. Why? The skin in the periocular area is thinner and often more mobile than anywhere else on the face, and subject to very fine to very pronounced creasing because of the muscles underneath. 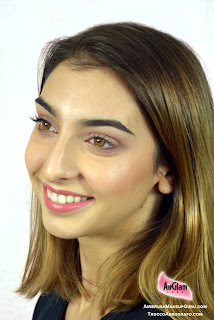 In order to color correct the area with traditional makeup we need products with a high coverage power yet the lightest possible texture, because whatever we apply on this surface will inevitably end up enhancing the creases and lines that can very often be found there, whether it be due to aging or simply to natural constitution. Enter airbrush makeup. First of all we have to dispel one of the most persistent false ideas about airbrushing: you CAN airbrush around the eyes, and it will NOT hurt, damage or irritate the eyes in any way, in fact it will bother the skin much less than a brush would. All you have to do is know how to do it. Once we have finally established that, let's see why we SHOULD airbrush the eye area. Because of the its complicated texture, the thicker the layers of product we apply, the more they will tend to move and set in the negative spaces thus making the texture more obvious. Airbrushing allows for the highest coverage with the lightest texture and thinnest layering imaginable, allowing for the best results. Moreover, the best products created for airbrushing don't need setting powder, set very quickly and remain in place without settling in fine lines for the longest time. Of course the end result in terms of effectiveness and durability will also depend on the unique characteristics of each individual, as factor such as age, firmness, oil production and so on will vary for everyone, but I can state with a certain confidence that if you try airbrush you may never want to go back to traditional. The following How To describes and illustrates the process used in the video tutorial enclosed in this article, as well as all the other tutorials we published. Please read the disclaimer at the bottom of the page before implementing any technique. Preparation: Start with clean, hydrated skin. The moisturizer you use should be the lightest, least oily type that the individual will allow. Once the moisturizer has been thoroughly absorbed, you can judge whether a primer is necessary or not. If you are working on young, firm skin with little to no texture, a primer will be superfluous. Ultimately it depends on the product you use as well, as some (especially the silicone based ones) will act as a primer as well. 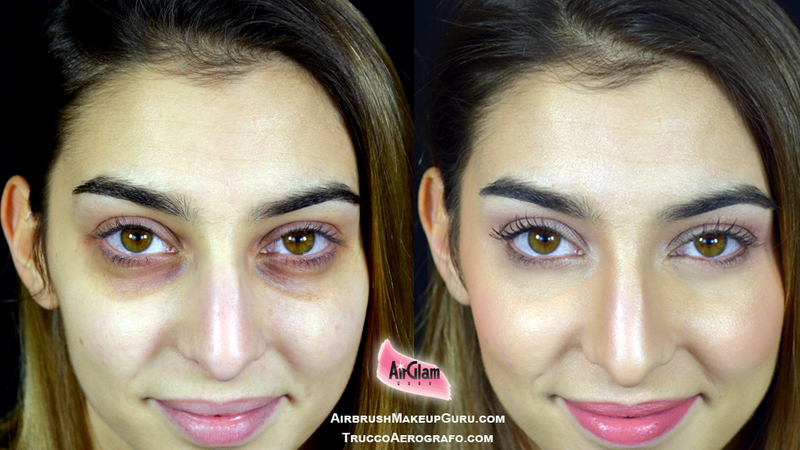 Application:When applying the makeup your client should start with closed, relaxed eyes. Give the person a chance to get used to the process and relax by spraying only air first, and describing the process. Your airbrush pressure should be set at the lowest PSI allowed by the type of product you are using. Test on paper first to make sure the nebulization is correct. Very often you will be able to correct the entire area without the person needing to open their eyes, which will be the most comfortable option. Very gently stretch the skin around the eyes to open creases and folds. You can do so by pulling lightly at the temple, the cheek under the eye or by "pinching" the bridge of the nose. Build the coverage using multiple passes and spraying as little as you can each time. Keep a suitable safe distance of at least 2 inches. Don't look to see the color you apply, rather observe the change in the skin and continue until you are satisfied. Angle the airbrush so you can spray under the bottom lashes and cover that area too. When the person opens the eyes, the skin closest to the eye rim might look uneven, as the whole texture can change. You can correct further by spraying light passes on the under eye area after asking the person to look up, so long as you are able to aim the air so that it doesn't hit the eye. You can also delicately place a soft plastic stencil directly below the bottom lashes to deflect any air at all from the eye if needed. Some people are more sensitive than others to air around their eyes, especially if they are wearing contact lenses. Make sure you test this before you start the actual makeup. Instruct the person to simply close their eyes if they feel their eyes water, and take a few seconds between passes so the person can relax. Have a q-tip ready should there be any tearing. Ask the person how they are doing all the time. Problematic skin or sensitive person: If the person does feel uncomfortable keeping their eyes open while you are spraying, or if the small area under the bottom lashes still needs touching up, you can certainly go in with a velour pouf or with a small brush and fix the area. In the case of very mature skin, you can also use tiny amount of colorless HD powder to set the area further. If I could award a makeup Product of The Year prize, this new starter set by Temptu would take it for 2017. This set includes seven colors that will allow you to neutralize any discoloration in the fastest time and with the tiniest amount of makeup. Color correcting in airbrushing is not done very often because the airbrush foundations usually offer enough coverage, and layering a color corrector underneath can create unwanted texture. 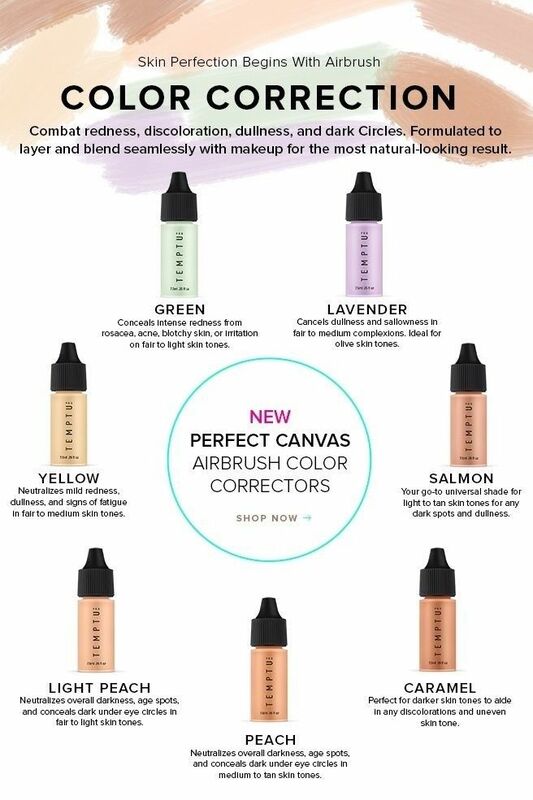 Moreover, because you are not applying a solid stroke of color but many tiny dots when airbrushing, the color correctors tend to be visible through the foundation or appear as grayish spots if applied too heavily. 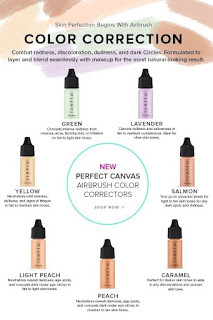 The game changes completely with this amazing set: their texture is so fine that they will literally erase the discoloration while you watch, and then rest invisibly under the foundation that you will apply on top. The Perfect Canvas formula means that these silicone based products behave almost like water based ones: they dry much faster and their finish is much finer that the classic silicone based counterparts. This makes them ideal for application in troubled areas, where they will not create extra texture, nor move or set in the fine lines even after many hours. Just like water based products, they generally won't require any powdering or setting after application. This set is a MUST HAVE for any makeup artist. Personal users who know what shade they need for their particular need will also be able to buy single colors from the Temptu Website. If you are outside the US, please check our LINKS directory for European Temptu retailers. Disclaimer and recommendation: we have just described a makeup application technique. You should always describe the technique in full before attempting it on someone else, and always ascertain that there are no medical issues or impediments of any kind in working around the person's eyes or your own. Always test on yourself before trying on others, after receiving medical clearance. The above only reflects the writer's personal experience and opinion, and should never be considered as or in place of medical advice. I hope this is effective for eye bag removal. Will try this! Caring for the skin around the eyes is a delicate process. Because it is thinner, it not only tends to be the first place to show signs of aging, but also is more sensitive than the rest of the skin. Revitol eye cream is very effective in curing dark circles or eye wrinkles. It's a must try cream.